There is no doubt that the basic building blocks of your little one’s nutrition are of utmost importance to today’s busy parents and fast-paced households. With so many children in the U.S. afflicted with childhood obesity and debilitating weight problems, it is of critical importance that we find healthier (creative) solutions to revising the American diet as we know it. 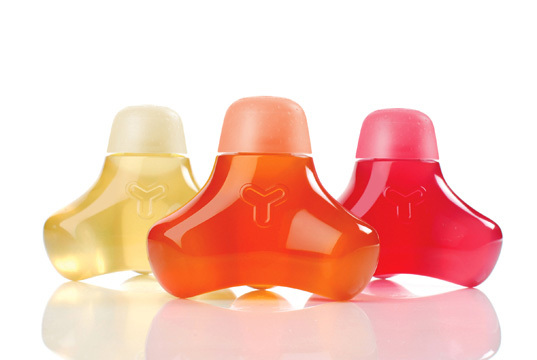 Enter celebrity product designer, Yves Béhar, and his new Y Water beverage. Conceived as a low-calorie, vitamin-packed alternative to sugary drinks for kids, Y Water is a truly innovative way to package a healthier drink via its reusable building-block bottles. 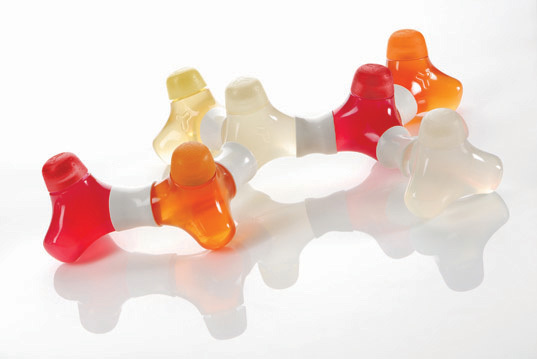 The DNA-like, interlocking food-safe bottles can be used as a toy after the organic beverage is sipped down, providing a two-for-one punch for sweet snack and playtime creativity. We love great examples of creative reuse when it comes to packaging and plastics, so Y water really caught our eye with it’s Pop Art design appeal and biomorphic eco-containers. Granted a nice sippy-cup of organic apple juice is probably about as sustainable as you get, but we have to confess that we like the message that Y Water sends to kids with its recycled packaging possibilities. We surely do not advocate buying up more products as a way of going greener, but if you are looking to quench your little one’s tastes for pop-like treats as well as encourage play with the remaining bottles, well, this is a fun green solution for design-savvy consumers. Y Water bottles are made from Eastman’s Eastar™ copolyester, a tough plastic used in the medial industry and certified safe for food use by the U.S. Food and Drug Administration. The bottles are environmentally safe and do not leach chemicals. Once finished with the product, parents can log onto www.ywater.us and receive a free mailer to send the bottle back for recycling. But why would you want to recycle such a cool collectible container? 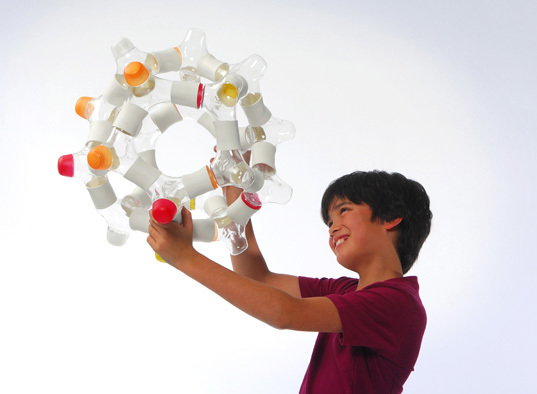 Once empty, the bottle can be linked with other bottles through biodegradable rubber “Y Knots”, connectors that help to create spaceships, animals, robots, or whatever else a child can imagine. Design for the next generation is shaping up in all sorts of interesting ways, and sustainable play might be just the way to get our kids in great shape, too! That may be. In the end when the children get bored with the product it will still end up in the garbage. Hyla, while your blog might have some good information in it, I read Inhabitat and Inhabitot because it is updated so frequently; Also, the F-bomb is dropped on your blog a few times making it less than friendly for some. Also, Inhabitat does not make judgement calls or share their opinions, they merely present all the facts and allow reading to make informed opinions and decisions. I think many informed readers would prefer to do that rather than have someone create opinions for them. I saw these at Whole Foods and thought,although a fun design, that they were expensive and wasteful. Our kids drink filtered water from their Kleen Kanteens. I am weary of vitamins in water and prefer to get them from our whole, fresh and organic foods we eat at home! While I appreciate Hyla's concern with plastic, in our commercial world products will always be packaged and I am a keen advocator of creating packaging that is multi-use as opposed to single use. And, hey, maybe some of those spoilt kids who "get bored and it ends in the garbage", can package them up and send them to an orphanage (Africa has many of those) and provide motor skill development to some underprivileged kids who don't get new toys when they're bored.